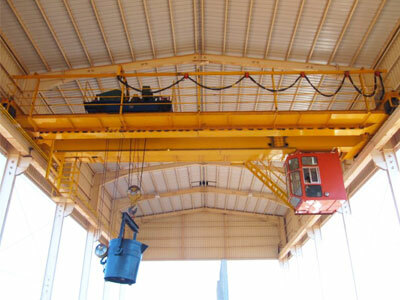 QDY type double girder casting crane is the main overhead lifting equipment used for steelmaking and continuous casting process. The casting bridge crane offers great protection and high-level efficiency in areas where the high temperature and dust present. It can lift and transport liquid steel ladle in a greater speed and efficiency than its single girder counterpart, making it ideal for heavy duty or severe lifting requirements. 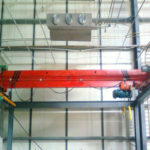 The casting overhead crane is capable of lifting a substantial amount of weight, usually is a range of 5 tons to 320 tons, and the work duty is A7. 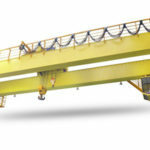 Thus the double girder casting crane can adapt to a much worse working environment. 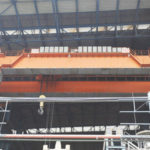 This particular double girder overhead crane is extensively used in many industrial fields, such as steel mills, petrochemical plants, foundries, power plants and other general industries. The environmental conditions where the crane is employed are severe, such as high heat and dust. And also the ladle crane undertakes frequent and heavy duty lifting tasks in such environments. Basically the temperature of the crane working environment is -10~ + 60℃, and when the temperature reaches +40℃, the relatively humidity should be no more than 50%. Main beam – insulation layer will be added to the bottom of the main beam so as to provide excellent resistance to heat and protect the crane bridge girder. Hoist trolley – this unit uses forged hook and steel core wire rope. 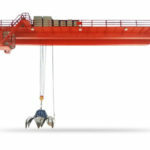 The hoisting mechanism adopts double brakes to ensure a safe lifting operation. Other options for casting crane hook include rotary spreader, load weighing and display. Crane travelling mechanism – forged or rolled wheels are adopted. Electrical device – the overhead crane adopts H-class insulation motor and heat resistant cables. Cabin – add insulation layer to the driver’s cabin. Advanced design and novel structure. Easy operation and accurate positioning. Long working life and easy maintenance. Overload limiter. In the event of overload, the hoisting mechanism will switch off and only move downward. Travelling limit switch. It is used to limit the crane travelling. Anti-collision device. It can be equipped when two or more bridge cranes are mounted to the same runway. Emergency stop button. In case of emergency, all movements can be stopped. Safety hook latch. It can be used to avoid loads falling off from the hook. Anti-falling protection device for crane and trolley three-in-one motor. 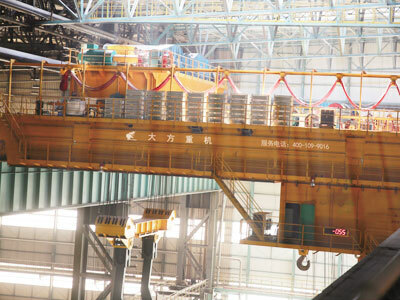 Dafang group is recognized as a leading overhead crane manufacturer and supplier in China. With more than 10 years of efforts and practices in the crane industry, we have become a trusted and competitive manufacturer enterprise. We can guarantee quality products, fast delivery and reliable service. 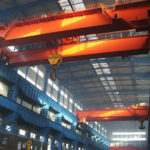 To learn more about double girder casting crane, contact us freely.